“Are you still following the dead Paris Agreement?” Al Sabban tweeted in response to former New York Times writer Andrew Revkin. Revkin was commenting on news that the U.S., Saudi Arabia, Russia and Kuwait refused to “welcome” the findings of a United Nations climate report released in October. The report said carbon dioxide emissions would need to decline 45 percent by 2030 to avoid warming greater than 1.5 degrees Celsius. The UN report said “rapid, far-reaching and unprecedented changes in all aspects of society” were needed to keep warming below 1.5 degrees Celsius. The report was agreed to in 2015 as part of the Paris Agreement. President Donald Trump plans to withdraw the U.S. from the Paris climate accord in 2020. 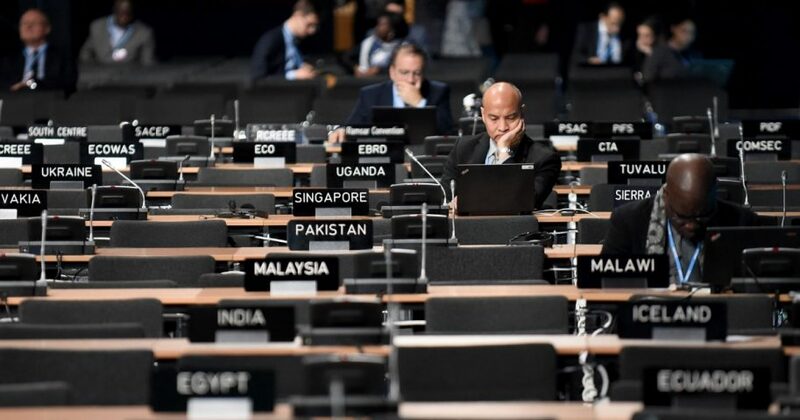 Bureaucratic chaos ensued when the U.S. only agreed to “note” the October climate report, joining Saudi Arabia, Russia and Kuwait. Around 30,000 UN delegates, government officials and environmental activists met in Katowice, Poland near the beginning of December to hash out next steps for the Paris accord, which went into effect in 2016. However, like pretty much every UN climate summit, divisions seem to be deepening over the particulars of meeting the goals of the Paris accord to limit warming. “Believe me. You wasting [your] time and money going to these meetings. I am in Saudi Arabia relaxed and whenever I follow the deadlock the negotiations are facing in Poland, I start laughing,” Al Sabban tweeted in response to another reporter. While it’s unclear if the Paris accord, which was agreed to by nearly 200 countries, there are some signs the agreement is beginning to fray at the edges. For example, Brazil declined to host next year’s UN climate talks at the behest of President-elect Jair Bolsonaro, who’s been called the “Trump of the Tropics.” Environmentalists are worried Bolsonaro could join Trump in withdrawing from the Paris accord. Riots erupted across France over a planned increase in fuel taxes as part of French President Emmanuel Macron’s global warming crusade. Macron, initially resistant to compromise, backed down Wednesday and canceled the tax increases set for January. Saudi Arabia, who Al Sabban used to represent, effectively asked the UN to push back any debate on furthering commitments aimed at fighting global warming. Saudi Arabia, the U.S. and Russia are the world’s top three producers of oil and natural gas. Al Sabban said he was “personally happy” to have helped end the UN Framework Convention on Climate Change (UNFCCC), the body that handles environment and climate issues.